At Cosmos Clinic, all our injectors are specially trained in performing dermal fillers; and one of our medical professionals has been appointed as an Allergan National Trainer (a prestigious title held by less than 20 doctors nationwide). Dermal fillers are made from naturally occurring sugar molecules and come in varying thickness. The thicker the product the longer it will last. The thicker consistencies are used for the cheeks/chin/nose/hands and the thinner consistencies are used for fine lines and under the eyes. Both can be used on the lips. Treatment times can span up to 30 minutes. Minimal discomfort is experienced the procedure. Slight redness, bruising, swelling and tenderness may occur for up to a week after the treatment. Results are visible immediately. Lasts between 6 – 24 months 1, depending on product consistency and injection site. Results can vary from patient to patient. Dermal fillers are substances used to enhance facial features or replace lost volume in the face and skin. Made from naturally occurring substances in the second layer of your skin. Local anaesthetic cream is applied prior to injecting, which minimises discomfort. Dermal Fillers treatment prices vary depending on your overall situation and expectations. What can I expect after the Dermal Fillers procedure? I’ve heard Dermal Fillers can be used as a preventative. Is this correct? What is the difference between Dermal Fillers and Collagen Stimulator Injections? Can I have any other treatments at the same time as Dermal Fillers? Which Dermal Fillers are used at Cosmos Clinic? At which clinic can I undertake Dermal Fillers? Dermal Fillers are a natural complex sugar (hyaluronic acid) that gives volume to the skin in areas suffering from volume loss. It is found in the second layer of skin called the dermis. As the skin ages, there is a gradual loss of this filler substance resulting in skin sagging, wrinkles and a loss of volume. 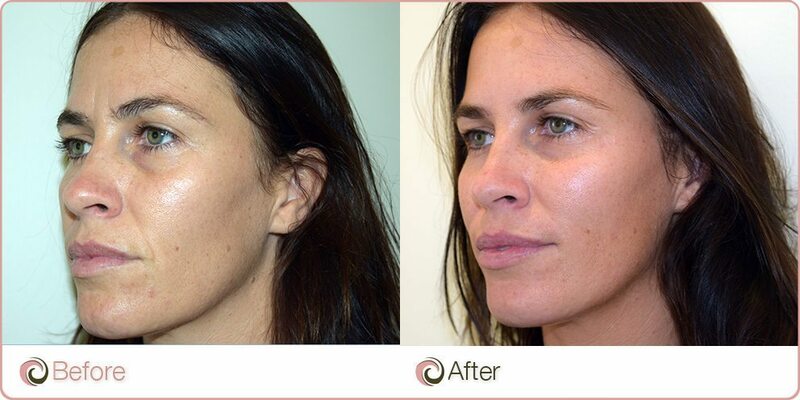 The filler helps to improve wrinkle lines and restore volume to areas affected by the ageing process. Filler adds volume to the skin by attracting water to the area where it is injected. Dermal Fillers play a major role in rejuvenating and reshaping the face without having to undergo surgery. It is a treatment that’s becoming increasingly popular to help reverse the ageing process. In treating ageing and lose of volume, Dermal Filler can be used in conjunction with Anti-Wrinkle Injections to provide optimal results for facial rejuvenation. Dermals Fillers and filler injections can also be used on various facial areas which can span the forehead, mid face and lower face. Facial fillers can be used to treat the tear troughs, marionette lines, nasolabial folds, mid face (cheeks), lower face (jawline) and also during lip enhancements, chin enhancements and non-surgical nose jobs. The procedures using Dermal Fillers are relatively simple and minimally invasive. Downtime is minimal and results can be seen instantly. Your treating medical professional (cosmetic injector) will determine the areas and extent of treatment with you. They will also discuss your objectives and your desired results. In minimising discomfort, anaesthetic cream and/or an ice pack are generally used to help numb the area . Local anaesthetic is also incorporated into the Dermal Filler product we use, allowing for a more comfortable procedure as you continue with the treatment. The product is injected and the total treatment time is up to 30 minutes. Numbing cream and ice packs are used to numb the area before the injections are administered by a dermal filler injector. The Dermal Fillers used at Cosmos Clinic contain a built in anaesthetic, so there is little to no discomfort. Slight redness, bruising, swelling and tenderness may occur for up to a week after the Dermal Filler treatment. It is a ‘walk in, walk out’ procedure and you can go back to work the same day. The results will be noticed immediately. Dermal Fillers can be used in the lips, chin, corners of the mouth, cheeks, smile lines, hollows under the eyes, and any of those fine lines around the face. They can also be used in multiple areas at once to refresh the face for a non-invasive face lift. Dermal Fillers can also be used to treat depressed acne scars, aged hands and to reshape your nose. Yes, Dermal Fillers can assist in preventing wrinkles from getting worse. Whilst Dermal Fillers add volume immdediately to treatment areas, collagen stimulator injections stimulate the growth of your own collagen to restore volume. Anti-wrinkles injections can also be performed at the same time as dermal fillers. It is best to wait 2 weeks after dermal fillers to have laser, otherwise we recommend undergoing laser directly before dermal fillers. At Cosmos Clinic, we use high quality Dermal Fillers. They are a smooth product, allowing for greater control and natural results. We have five different types of preparations, allowing for effective treatments on different areas of the face. It is made from a naturally occurring substance in the body and has the added benefit of being soluble. This means that should too much be injected, the product can be dissolved and the area can be corrected with ease. It also has a built-in local anaesthetic allowing for a quicker, more comfortable treatment, as well as less swelling. At Cosmos Clinic, you can be assured that our staff are fully trained and qualified in injecting Dermal Fillers. Dr Joseph Ajaka is a National Trainer for injectables, and teaches the latest, up-and-coming breed of injectors. This is a prestigious title, with less than 20 people Australia-wide in this position. The most common side effects are those associated at the injection site, such as swelling, redness and itching. These are usually mild and resolve within one week. The risk of developing serious complications is small and will be discussed with you at your consultation. Your initial Dermal Fillers consultation and subsequent procedure can be undertaken at one of our cosmetic clinics in Australia. Either in Sydney, Canberra, Adelaide or the Gold Coast. We also treat many interstate and overseas patients each year at Cosmos Clinic. Therefore, we have set procedures in place for those travelling to our clinics for treatment. For travelling patients please use the contact form located at the bottom of this page to send us images of the areas you wish to have treated, which Cosmos Clinic you’d like treatment at, and where you’re located in the description so our staff can include all the appropriate information for travelling patients as part of your personalised quote.